I don’t remember who told me I needed to invite Colleen Duggan onto my podcast back in 2015 (waaaay back two babies ago when I podcasted…nuff said), but I’m so glad I did. Now let’s all just stop and sit with that one for a moment, shall we.. Even though I barely ever blog these days. Even though when I got Colleen’s email I was nursing a three-week-old at 2am and was OH-VER-WHELMED (still am, mostly) with five young children, and homeschooling, and what I’d serve for breakfast, and what a mess my house was, and how many times I had lost my temper Big Time with the kids that day. I had a hunch this book was going to be a good read for me. After reading it, I really do think it’d be a great read for some of you, too. Because…ya’ll…just the title of this book is such an important lesson for us moms. Sometimes especially for Catholic moms. I read so much in Good Enough is Good Enough that spoke truth to my own anxieties, insecurities, and temptations as a Catholic wife and mother. That last quote is so awesome. It’s one I need to pray with often. We’re not responsible for being perfect, but we’re responsible for trying our best. Every night, Michael and I pray together before going to bed. It doesn’t take long, and it’s nothing fancy. But it’s faithful. (And isn’t that so much the point?) Daily couple prayer is a Domestic Church commitment that has become a quiet anchor in our marriage. When we pray every night, we pray that God would multiply our efforts as spouses and parents, and give us wisdom and right discernment. We thank Him out loud for the blessings and successes of the day, and we ask for His mercy to work out any problems we had or messes we made. We pray for help to do our best, and we ask God to do the rest. 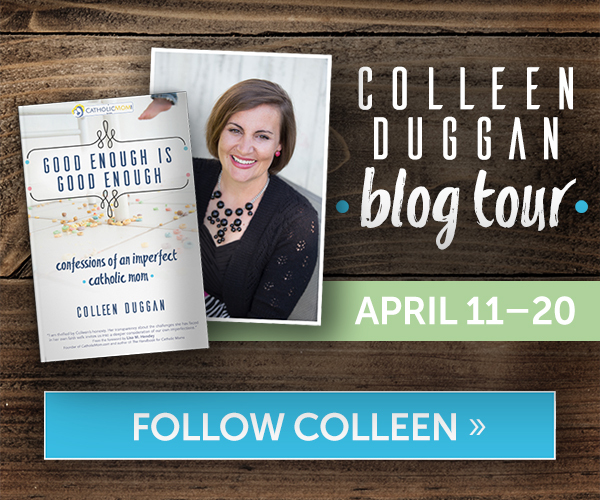 Colleen’s humble honesty in this book about her own struggles reminds us that we all come to the table of marriage and parenthood with different gifts, weaknesses, personalities, spouses, children, resources, backgrounds, and–maybe most importantly–Heavenly plans for our lives. Colleen puts it so well: we aren’t growing into the women God created us to be despite our internal and external struggles, but through them. 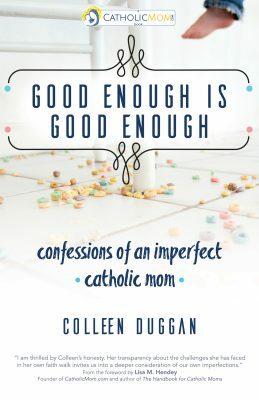 I am actually the very last blogger on this official blog tour of Good Enough is Good Enough: Confessions of an Imperfect Catholic Mom. Below is a list of the stellar women who have preceded me on this blog tour, with links to their reviews. It was an honor to be asked to review this book, and I love the idea that some of you may be blessed by the book because you read this review.